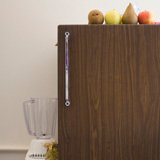 Is your mini fridge looking a little bare? We have the answer! Package includes 24 pack bottled water, 24 pack canned soda, 6 mixed fruit cups, 2 hummus cups & 2 energy drinks. Please place your order 24-48 hours in advance of the requested pick up date. Tax is not included in the purchase price.